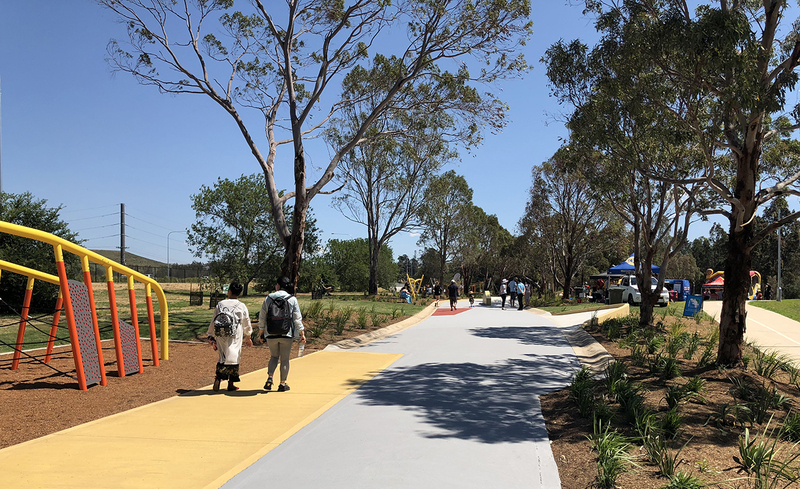 When asked to improve recreation facilities for this reserve, we analysed the existing roadway which cut right through the centre of the park and the carpark which was located in an unsafe area, and decided to design a new carpark closer to the main road/park entry and creatively utilise the road for “play”. Harrington Park Lake Reserve is located adjacent to The Northern Road in Harrington Park, NSW. 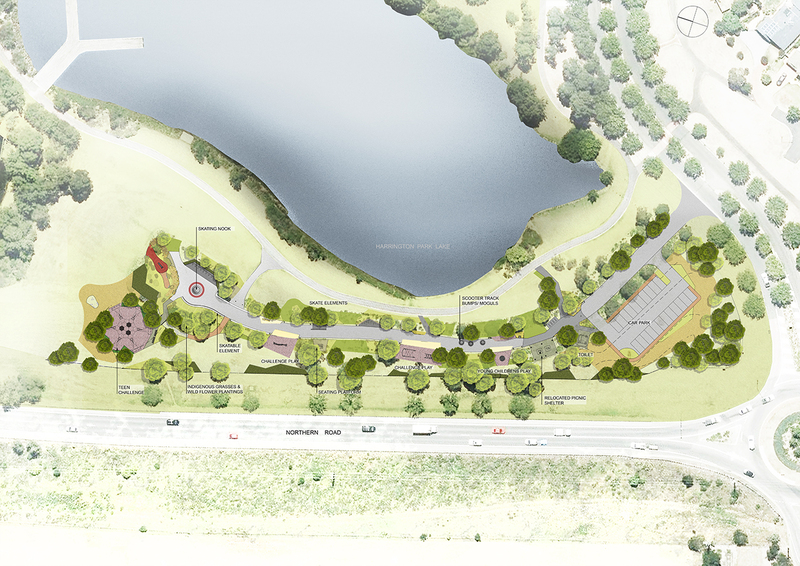 Central to this 25 hectare reserve is a large lake which is the key focal point for this park. 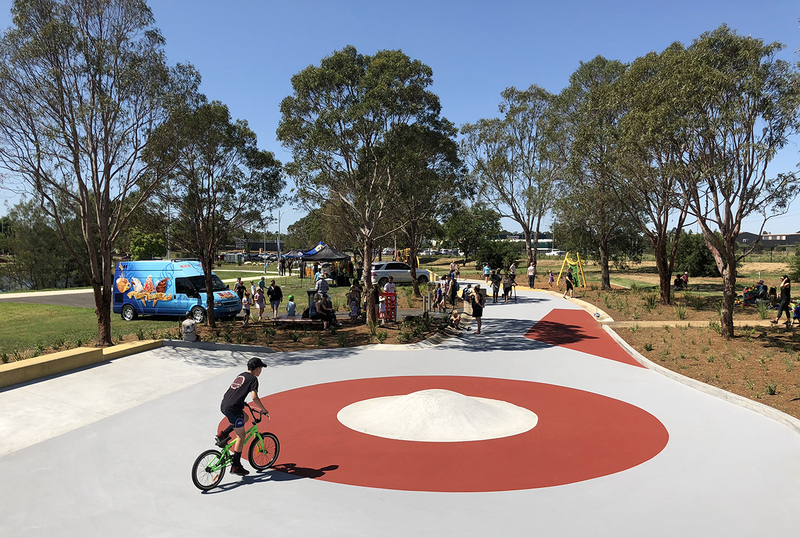 Existing pavement is used for connectivity between the various active hubs proposed for teen’s challenge play/obstacle course areas and smaller children’s play. Age appropriate play experiences vary in type and provide a journey along the route- from younger less challenging scooter tracks and moguls at the southern end near the pavilion, to more challenging experiences and equipment towards the north for teens/older focus, culminating in a challenging, “Giant Orion Space Net” climbing experience at the end of the journey, overlooking the open space. The defined spaces are designed as nooks along the road, using abstract geometry reflective of an abstract painting. Space between the areas provides much needed relaxation hubs and room for various groups to share the space without conflict. Skating elements are integrated within the road pavement to the edges in particular, with jumps, pyramids, including skating ramps, steps, steps and ramps, mounds, widened lips, and moguls to the new pathway. 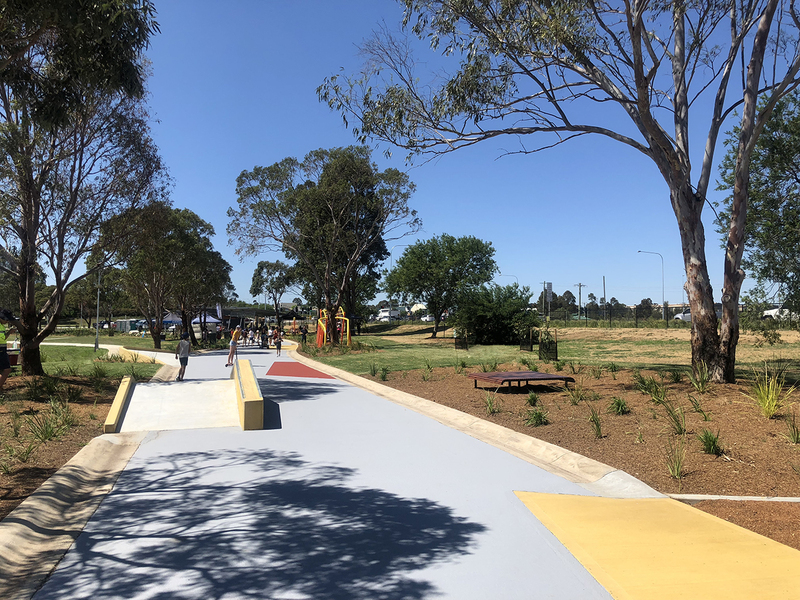 Planting of lower storey, indigenous native grasses and tussocks will provide textural interest and spatial definition, including a “native meadow” area for environmental education and general park aesthetics. Creating a mound within the existing carpark utilised excavated material on site, minimising cost and labour. In the future, an integrated art strategy could further “energise “the existing asphalt with children’s games, and ‘graffiti montages’ especially to accent the skating elements.